As a Filipino, cuisines made and originated in the Philippines has a special spot in my heart and on my taste buds. Every now and then, I crave to taste different variety of Filipino cuisine. May it be cooked traditionally or with a twist, Filipino food is always on my Foodie-A-List. 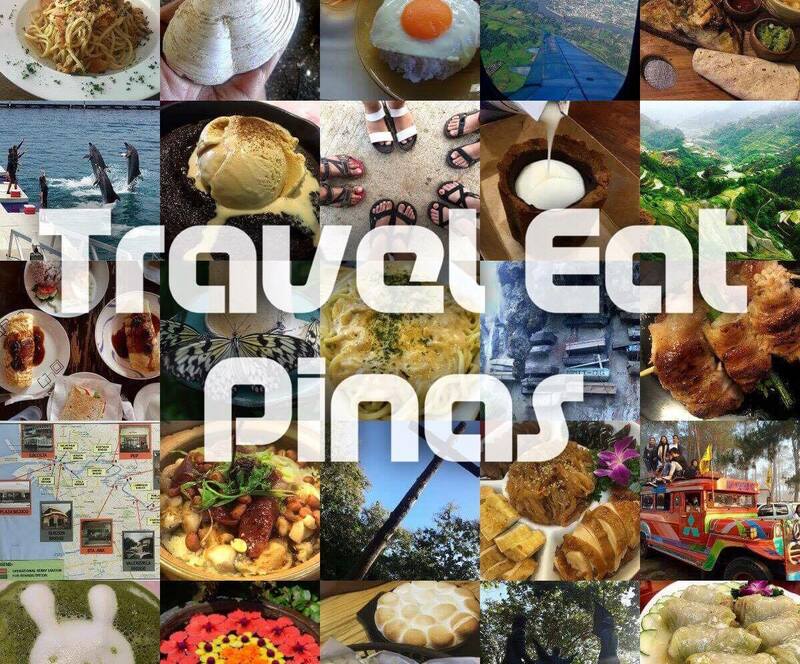 Few weeks ago, when I was in Makati City, my palate suddenly crave for Filipino cuisine. My sister, who was with me that day, and I searched along Greenbelt for restaurants or Café that offers my cravings. After searching the area and food reviews online, we later on found ourselves in Kabila Filipino Bistro. Crafters of M Cafe serves Filipino cuisines through Kabila Filipino Bistro. 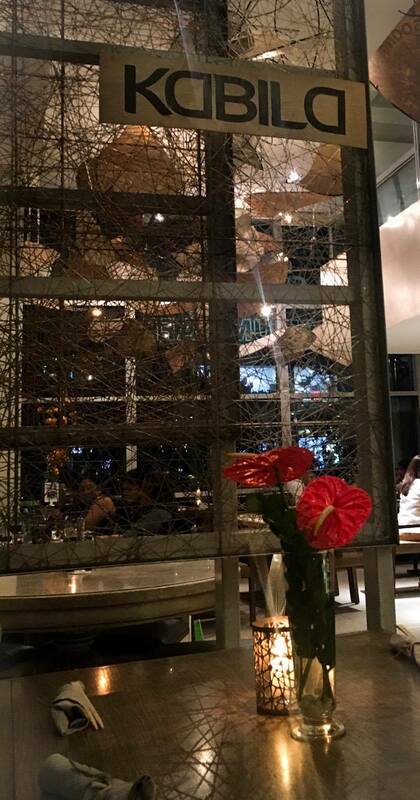 Kabila Filipino Bistro is located in Museum Café or best known as M Café. 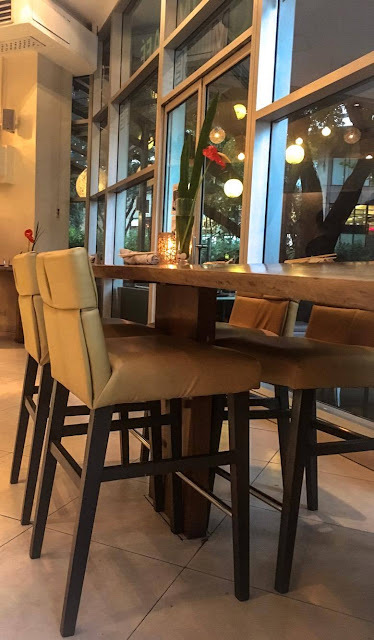 M Café has a cozy, modern and elegant interior design making the latter a perfect venue for events, business meetings, cocktail night with your team and an intimate dinner date with your love ones. Elegant and stylish interior of M Cafe. 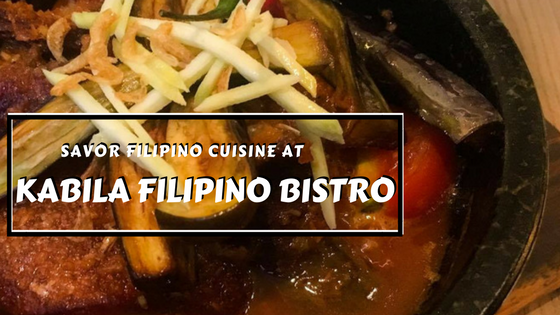 M Café is know for its wide array of delectable Asian cuisines and along with this are the Filipino dishes offered by Kabila Filipino Bistro. Kabila serves dishes that can be savored in the different region, cities and island of the Philippines. Kabila’s menu was intricately put together to make sure that each guest can enjoy the variety of flavorful dishes found in the Philippines. My sister and I started our Filipino cuisine banquet by ordering Bagnet Binagoongan, Adobo sa Pula, BBQ sa Kabila, Tinola Rice and M Café’s Leche Flan Turon. 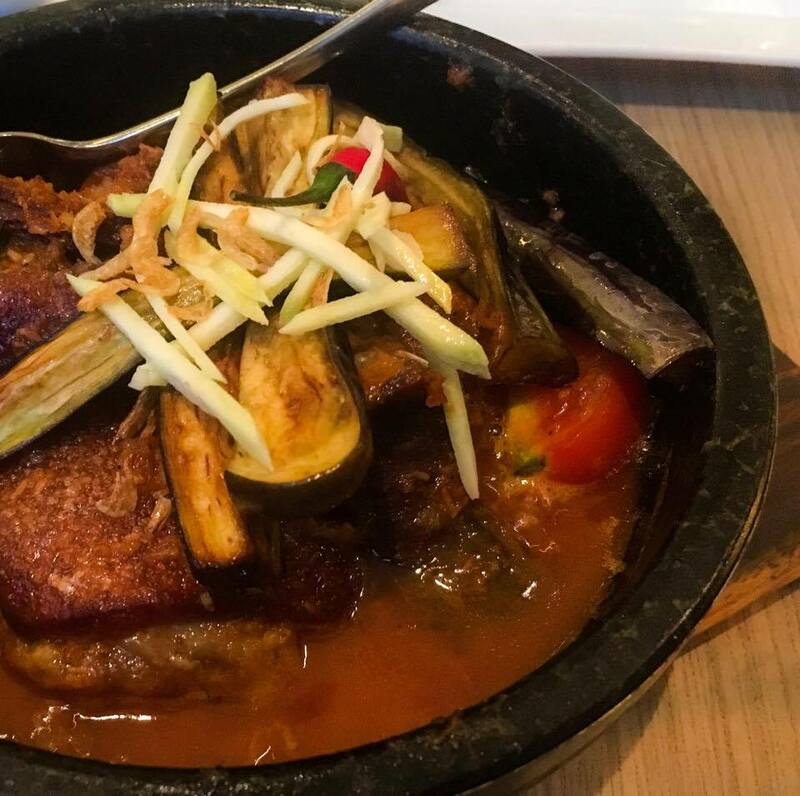 Bagnet Binagoongan has tender and juicy Bagnet with crunchy skin, shredded green mangoes, native eggplant, tomatoes and shrimp paste broth. What I love about this dish is, it is not salty considering that one of its main ingredient is bagoong or shrimp paste. Instead, of being salty, this dish has a rich tomato flavor that blends well with the bagoong. This dish is definitely a MUST TRY! Bagnet Binagoongan is good for 2-3 person and costs Php 395. Adobo sa Pula consists of spicy boneless chicken, classic adobo sauce and banana. Adobo sa Pula with spicy boneless chicken. Adobo sa Pula has the perfect harmony of the sweetness of banana and classic adobo sauce’s sour sand salty flavor. The chicken meat on the other hand is so tender and flavorful. 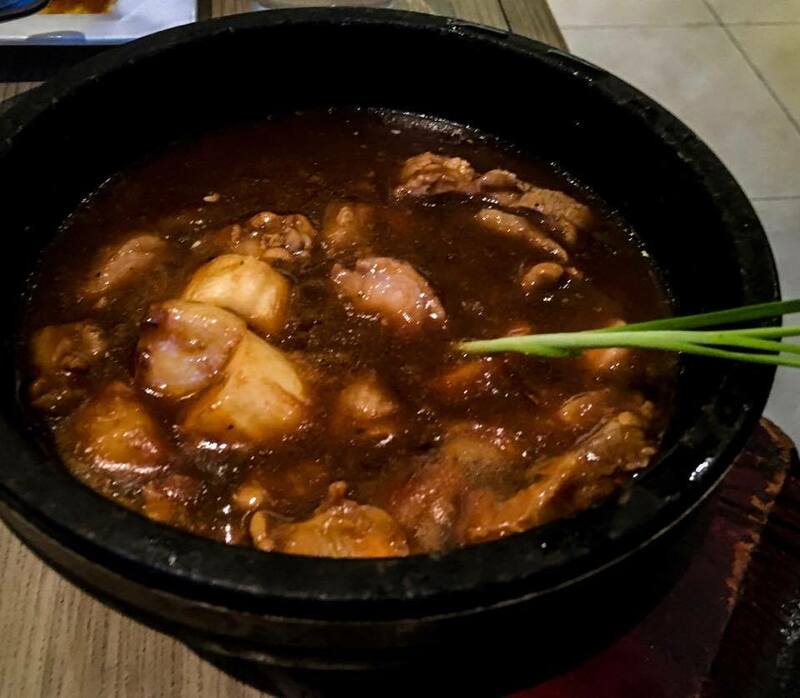 Adobo sa Pula is good for 2-3 person and costs Php 395. Guests can choose from pork, tiger prawn, chicken skin skewers and gindara for BBQ sa Kabila. During our visit we choose pork bbq. Pork bbq sa kabila is served with the tradition pork bbq street food on a charcoal grill. The pork bbq is a bit salty but you can drizzle some calamansi or apply some sauce to harmonize its flavor. 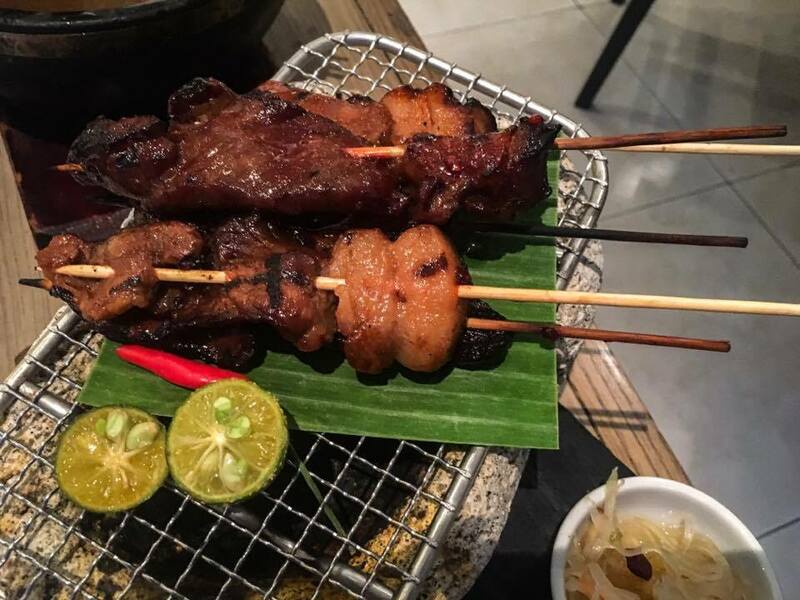 Pork Bbq Skewers ( 5 sticks) costs Php 295, while Tiger Prawns is Php 475, Chicken Skin Skewers is Php 195 and 200g of Gindara costs Php 375. Tinola rice has the oily texture and gingery flavor of Tinola’s broth. It is good for sharing and costs Php 195. 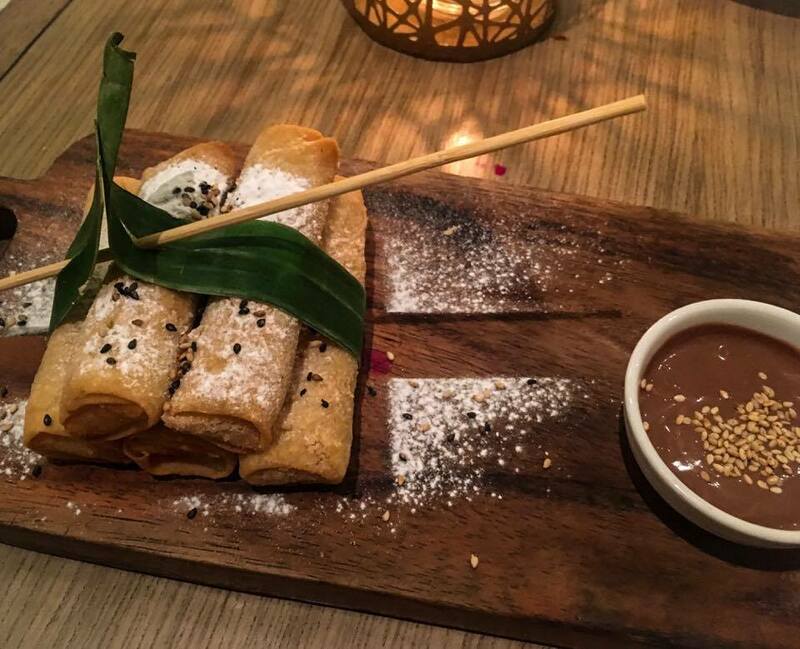 Leche Flan Turon is served with five turon in creamy Leche Flan filling and Chocnut chocolate dip. Chocnut is a peanut milk chocolate and is one of our (and most Filipinos) favorite chocolate. Leche Flan Turon costs Php 195. Kabila Filipino Bistro didn’t fail my cravings for Filipino dishes. Each dishes that we tasted are flavorful. My palate enjoyed everything but my top picks are the Bagnet Binagoongan and Tinola Rice. I love the tender bagnet and its crispy skin even if it has been soaked on the bagoong broth for a long period of time. 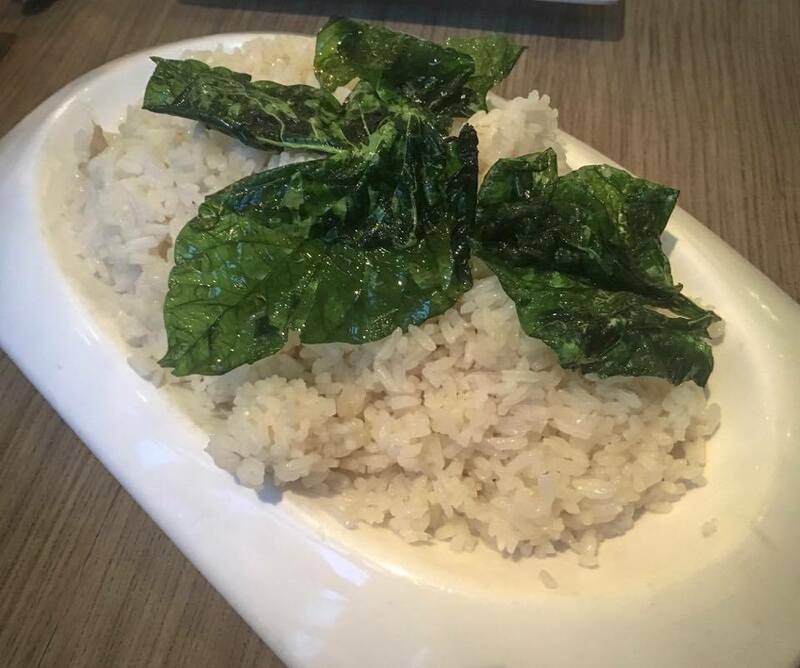 While for the Tinola Rice, we ordered the former because we got curious on its taste and after some spoonful of it, I must say, that it is worth the try.